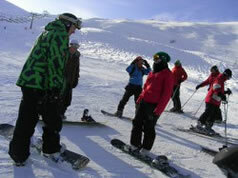 Based at the foot of the Tatra Mountains in south- eastern Poland, Zakopane is not just a place to stay for people wishing to experience some of the best skiing and snowboarding in central Europe; it is a colourful and thriving example of why tourism in Poland has expanded in recent years and will continue to do so for some time. Of course Zakopane has the luxury of being overlooked by a magnificent mountain range attracting millions of people both in winter for skiing and summer for hiking, climbing and camping. 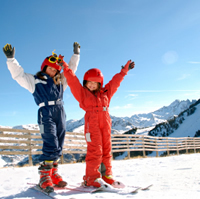 However, take away the mountain-based activities and the town of Zakopane has something for everyone. 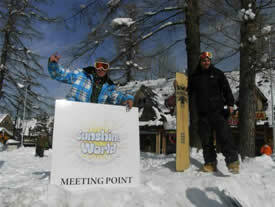 Anybody wishing to take time out from skiing need not worry about being bored in Zakopane. The main street through the centre of town (Krupowki) is full of variety and easy to navigate around, as it is simply a pleasant, straight, pedestrianised road stretching through the heart of Zakopane. Through Christmas and New Year the Krupowki is beautifully decorated with stylish lights that fit the mood of the town perfectly. Combine this with the snowy mountain backdrop and the snow filled streets and Zakopane at this time has a truly wonderful feeling to it. Throughout the year you will find the Krupowki filled with a number of street artists helping keep the town alive with colour and fun. The Krupowki has restricted access to cars, however it is advisable to keep an eye out for the odd car skidding there way up the often-icy street. Whether it is shopping, eating, drinking or you are just looking for things to do this guide will tell you what you could expect to find in Zakopane. The Krupowki and one of the traditional market stalls. If you are looking for souvenirs from your holiday you need not look very far, Krupowki is full of local people selling a variety of cultural souvenirs as well as the usual array of tourist souvenirs you would expect to find. You will find shops selling almost everything you could possibly think of along Krupowki, clothes shops covering all shapes, sizes and designer makes. Sports shops selling all the equipment you could possibly need to venture into the mountains or just to grab a sledge to have some fun sliding down some of the local streets and hills. If you want to get a more local feel for the town you can venture to the bottom of Krupowki and just across the road is a buzzing traditional market selling locally made jackets, rugs, paintings, carvings, delicacies and a selection of other goods including real live St Bernard puppies, probably a good idea to try and resist the urge to take one home! 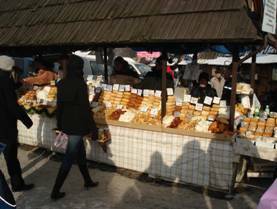 Whilst you are shopping you will definitely see many stalls selling Oscypek, a delicious locally produced cheese from sheep’s milk. It is definitely worth a try and comes in all shapes and sizes, if you are not too adventurous you can buy Oscypek made up in simple cheese strings or why not try a freshly grilled slice with home-made cranberry jam? There are banks, chemists and post offices dotted all around Zakopane so you need not worry about a thing. Prices in the shops are very reasonable for such a popular tourist area, there is nobody trying to make quick money from tourists in Zakopane as you get the feeling local people are happy that tourists are visiting there town and helping it to grown into an increasingly popular destination. If you need help whilst shopping smile nicely and you will find a lot of people do speak some English. 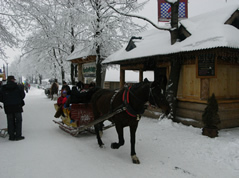 Learn your way to the Krupowki and any shopping you may wish to take home from Zakopane will be found somewhere there. 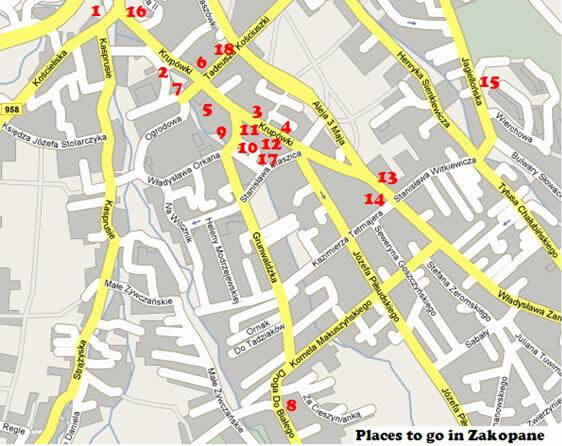 A few shops to look out for along Krupowki street. 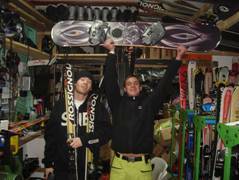 If you forget something or you just want to get some new clothes in Zakopane there are plenty of places to look but for a big choice at good prices, look out for – CROPP TOWN - Great for young people looking for a bargain - Diverse - Burton - Billabong - Rossignol - Nike - Oakley and many more. 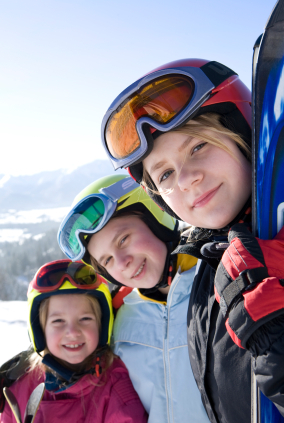 If you need sportswear for skiing/snowboarding or any summer activities there are many large shops selling top of the range brands, however keep an eye out for the smaller local ski shops such as SNOW EKSPERT, where you can buy quality equipment at cheaper prices and also get any of your own equipment serviced. You can also find a great deal in InterSport at the top of the high street. One thing Zakopane is definitely not short of is places to have a good meal and a few drinks. Again the majority of bars, pubs and restaurants are found scattered down Krupowki but before getting drawn towards the golden arches you should definitely take a look inside some of the towns local restaurants. The local restaurants are easy to find in town as they all have restaurant signs outside and the majority are located inside the traditional wooden buildings that give the Krupowki its elegant look. If you are willing to give the local food a try you are guaranteed to find some tasty dishes and you will often get more than just a meal, as local bands can be found inside many restaurants dressed in traditional outfits and enthusiastically blasting out there traditional highland folk music. The prices of food in town vary as they do anywhere but the value is in the local food, it is similarly priced to fast food outlets in the UK but you can expect to leave with a full stomach and a new taste in your mouth. If you're looking for something traditional but with a slight feel of home, check out a restaurant like Sphinx. Here you can get anything from Steak, pasta, fresh fish, kebabs, Pizza and chicken wings. Our favourite restaurant at Sunshine World is Gazdowka, this is a traditional restaurant just 10 minutes from the high street with Michelin quality (although the Michelin man has yet to recognise them officially- soon no doubt!). Don't be scared away by the stuffed animals dotted around the restaurant. You can get a large meal including soup and a main course from as little as 20zl per person at lunch times- dinners from around 50zl- 150zl per head depending on your tastes. If however you are looking for a place to go for a special occasion or you just fancy treating yourself there are a number of other up-market places to eat in Zakopane that won't leave you disappointed. The Belvedere Hotel, well known as the best hotel in Zakopane is host to two wonderful restaurants both of which are open to everybody. The first restaurant, Pod Aniolem (means "Under an Angel") situated on the top floor serves traditional Polish food, cooked with the very best ingredients by passionate and talented chefs. If you do not fancy the local food then there is a perfect second choice located on the ground floor, Ziemianska that serves dishes from around the world in an environment of high class Polish hospitality which honestly rivals anything which Paris, St Tropez or Val D'Isere have to offer but at prices which leave you feeling you're not paying enough! When you have enjoyed a meal in one of Zakopane’s many restaurants then surely it must be time for a few drinks. 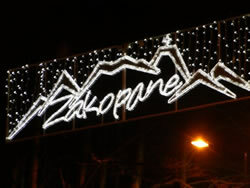 Whether you want to go for an all night party or you just wish to enjoy a quiet cocktail, Zakopane has everything for a good night out. 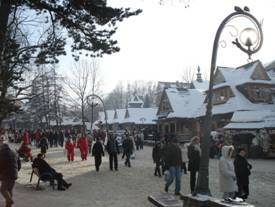 Look out in the bars for the local favourites of mulled wine (Grzaniec) and warm beers with fruit juice. Host to nine nightclubs and plenty of bars and pubs you can take your pick as to the kind of night out you want to have. Krupowki can be just as lively at night as it is during the day and you should not feel at all threatened walking around at any time although late at night it's advisable to stay in a group just in case. Bars generally close at around 12 o’clock and nightclubs somewhere around 3-4 o’clock with taxis operating around the clock to make sure you get home safely. If you do not want to do much walking between bars on your night out then you may want to start off in Appendix or Paparazzi, a couple of stylish cocktail bars with a relaxed friendly atmosphere situated just off the Krupowki. From either of these you can simply walk 2 minutes down the road to Dworzec Tatrzanski ( "The Old Bus Station") which is the best all round club in Zakopane. Here you have a dance floor, Bar, sofas and an outside terrace to cool off or have a smoke or a quiet chat. If you are more of an adventurer and want to visit every bar in Zakopane in one night then you can work your way up from the bottom end of the Krupowki where you will find the likes of Appendix, an upstairs bar which often host's live bands and music. You can then move up the street stopping at a selection of places, Morskie Oko, a nightclub but also a good stop off point for a few drinks as it opens early and has plenty of seats and a stylish pool hall with private bar. Seagrams, an Irish bar in Zakopane and then up to the top of the Krupowki stopping at any bars on the way. 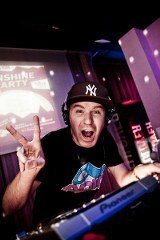 At the top of the Krupowki you will find 1 more nightclub, Prestige, a small underground nightclub with a friendly atmosphere. New in 2012 there is a beach bar about 5 minutes from the top of the high street. Why not pull out a deck chair and relax (best in summer of course). So if you are not drinking, eating, shopping, skiing or walking around the mountains in Zakopane what else can you be doing? Well the answer is a long one; there are plenty of other activities for people to do. There are also numerous natural Thermal baths around the surrounding villages of Zakopane, the closest just 5km from Zakopane. 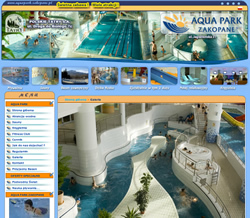 Szaflary has Indoor and outdoor pools a Steam room, Jacuzzi and water slides. Terma Bania is a new state of the art aquapark located next to the slopes of Bialka Tatrzanska which we used most often for our skiing and snowboarding days. Terma Bukowina is also well worth a visit and has a world class luxury hotel, traditional restaurants and a peaceful location with stunning views of the Tatra mountains for if you're looking for a more romantic setting for your holidays away from the hustle and bustle. 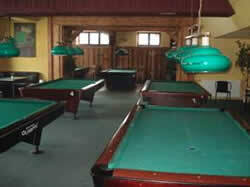 If you are looking for something to do in the evening then there is a pool hall at the bottom of the Krupowki at Willa Monte Rosa with 8 American pool tables, a table football table and a number of games machines. Here a beer is just £1.20 and the private bar serves a range of great drinks from around the world. This is another good venue for a whole night out as downstairs from the pool hall there is a top quality pizzeria restaurant. 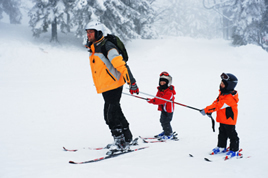 Depending upon the season in Zakopane you may want to take some time out to try driving a skidoo or flying around a dirt track on a quad bike. Either way the companies operating these tours will take you into areas of the forest and lower regions of the mountains that you would not get to on foot. If all you want to do is relax, then there are many places in Zakopane where you can be pampered. The Belvedere hotel has a designated wellness centre where you can choose from a large selection of massage and beauty treatments or indulge in a vast range of saunas and steam rooms. You will also find a swimming pool, water slide, pool tables, ten-pin bowling, a golf simulator, a basketball court and squash courts within the Belvedere hotel again open to everyone to use. Another hotel providing similar facilities to the Belvedere is the Litwor Hotel located right in the middle of the Krupowki; the Litwor has a spa, swimming pool area and a number of beauty treatments available. Another main attraction to Zakopane is the world cup ski jump, attracting thousands of people when the main event comes to town, the ski jumping Championship. To see some action this season the best dates to come would be over 10th-13th January. If you are in Zakopane when the ski jumping is on you cannot avoid the hype as the whole town goes crazy. However, if you are not in town during the actual championship you can still take in the spectacle of the ski jump as for a small price you can take the stairs to the top of the ski jump and imagine you are Eddie the Eagle himself. Not that you can jump but the sheer thought of taking off from the top will be enough to make you glad your stood behind a glass window. Useful Information - What do things cost?